People today are more likely to enter the world via a cesarean birth than those from previous generations. This has resulted in higher rates of surgical complications, maternal morbidity and an estimated increase in subsequent pregnancies of placental disorders, which can be fatal. Recent research suggests that benefits to moms and infants decrease after the total cesarean birth rate reaches around 19 percent. While there is no target for the overall cesarean birth rate, the United States’ obstetric care providers have been tasked by the Department of Health and Human Services to meet Healthy People 2020 goals, which include lowering the national low risk cesarean birth rate in first-time moms (NTSV) to 23.9 percent and lowering the repeat cesarean birth rate among population with low risk births to 81.7 percent. Some progress has been made in lowering the NTSV cesarean rate since the target was set. The NTSV cesarean rate dropped from a high of 28.1 percent to 26 percent in 2017. The low-risk repeat cesarean birth rate is not reported by CDC, but data show that only 12.4 percent of women with a previous cesarean gave birth vaginally in 2016. This low rate is a consequence of limited access to vaginal birth after cesarean, or VBAC. Even if rates of cesarean birth utilization and availability of VBAC were suddenly achieved and sustained at levels deemed medically optimal, we would still be facing a widespread public health dilemma caused by decades of cesarean overuse and lack of access to VBAC. Cesarean birth overutilization and VBAC underutilization over time has altered the birthing population today and for years to come. A national sample of inpatient discharges shows the steep increase over time of women giving birth annually with a history of cesarean birth. CDC data paint a similar picture over time as the HCUP National Inpatient Sample, showing that the number of patients giving birth annually with a previous cesarean birth has tripled since 1980. 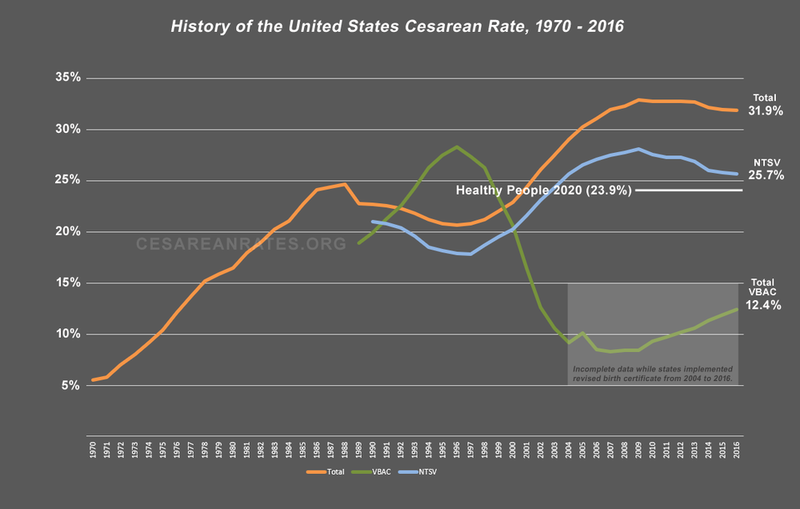 Public health and quality improvement efforts focus on preventing the first cesarean birth in first time mothers with low-risk deliveries and, as seen in the graph above, this rate has plateaued. However, continuing failure to provide systemic access to risk-appropriate care, inclusive of non-surgical birth options for the growing population of patients with a previous cesarean birth, leaves up to 15 percent of the birthing population annually at risk for major abdominal surgery, abnormal placentation and increased morbidity and mortality. Existing quality measures and the suboptimal state of data collection and reporting in the United States imply that the 600,000 women giving birth annually are not a current high priority. In addition to being a member of the National Quality Forum to advocate for the development of a measure to address the needs of this population, we recognize that our country doesn’t have years to spend on the measure stewardship process before proactively addressing the needs of this population. 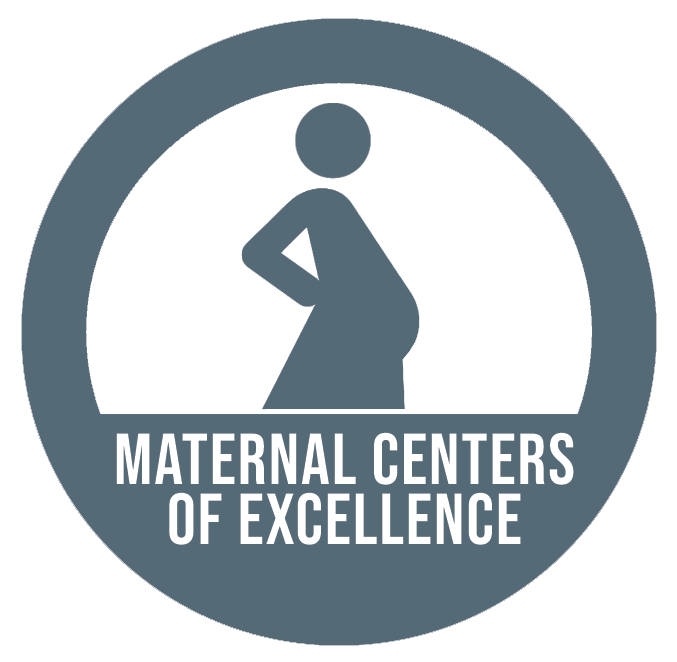 Pushes the boundaries of existing quality measures by implementing a accountability framework for minimum facility standards for maternal and perinatal safety and rewarding and marketing high achievement. Utilizes current professional consensus documents to promote alignment between professional societies, ratings organizations and consumers regarding maternal safety measures and methods. Data collection, which will include both rates and hospital policy information, which will directly benefit both a) the 600,000 patients annually giving birth with a previous cesarean birth and b) the scientific community, who will be able to use these data for research. Increased awareness of placental disorders, regionalization of maternal care and rural obstetric care issues. Identification of hospitals with a need for support in improving quality and implementing safety protocols. High-quality information for 600,000 patients annually to easily locate facilities that meet their needs. Ensuring that our MCOE program complements and supports existing accreditation, certification and verification programs without duplicating efforts. Responsible data collection and sharing practices. Maintaining up-to-date knowledge of clinical guidelines and practice bulletins. Reducing barriers to participation for critical access and rural hospitals by keeping the MCOE survey and/or audit process low-burden and low-cost, or subsidized through charitable contributions. HCUPnet, Healthcare Cost and Utilization Project. Agency for Healthcare Research and Quality, Rockville, MD. https://hcupnet.ahrq.gov/. Maternal, Infant, and Child Health. (n.d.). Retrieved from https://www.healthypeople.gov/2020/topics-objectives/topic/maternal-infant-and-child-health/objectives. Placek, P. J., & Taffel, S. M. (1988). Vaginal birth after cesarean (VBAC) in the 1980s. American Journal of Public Health, 78(5), 512-515. Contact us to learn more about the MCOE program.